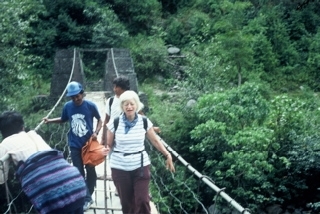 In 1984, sixty-year-old Olga Murray – a lawyer at the California Supreme Court – visited Nepal as a tourist to go trekking. An inveterate traveler, Olga had a tendency to “fall in love with countries,” but Nepal was special. The next year, she was back in Kathmandu. She met a friend who was working as a volunteer English teacher at a boys’ orphanage (the first in Kathmandu) called Paropakar. The orphanage, which housed 45 boys from 5 to 16 years old, was located in one of the most crowded, noisy, polluted areas of the city, on the banks of a filthy river. The toilet area was putrid, and there was no running hot water. The boys slept in one room, had only a small play space, and seldom left the premises except to go to school across the street. But the boys were bright and eager. They actually felt fortunate to have at least some food, shelter, and education, which was better than the thousands of Nepali kids who had nowhere to live but the streets. Unfortunately, those same streets awaited a Paropakar boy once he turned 16 (finishing 10th grade, the end of high school in Nepal). At that point, he had to leave the orphanage, totally unprepared for life outside its walls. Family connections mean everything in Nepal, but these boys had no relatives to help them. “But I still couldn’t get enough of Nepal,” Olga says. “Two years later, I went on another trek – and promptly broke my leg.” Read on for why Olga believes that was the best thing that happened to her…. Olga Murray had fallen hard for Nepal – so hard, in fact, that she slipped and fell on a trek in the Himalayas. 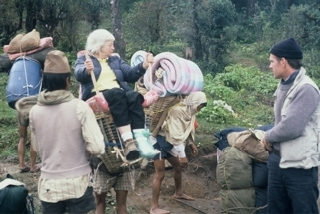 Carried for days in a basket on the shoulders of a Nepalese porter back to Kathmandu, she consulted a young Nepali orthopedic surgeon who had just opened a small hospital for children. All treatment was free and of a very high standard. Day after day, she saw kids with the most terrible disabilities being brought to the hospital, often carried for days down mountain trails, accompanied by dazed relatives, many of whom had never been out of their villages and had never seen a car or electric lights. Some of these children were abandoned at the hospital by families too poor to feed a child who couldn’t contribute to their survival. Others were so badly disabled that they couldn’t get to school over the mountain trails when they returned to their villages. Still others had intolerable home situations. With friends, Olga began giving scholarships to some of these kids, too. By 1990, people had heard about this work and wanted to help. The Nepal Youth Foundation was formed in 1990 and was granted tax-exempt status by the U.S. Internal Revenue Service. Two years later, Olga Murray retired from the practice of law after 37 years as a research attorney with the California Supreme Court. 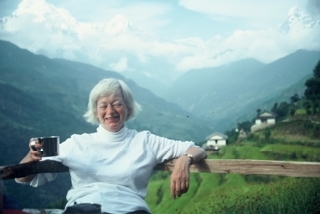 She began to devote all her time to the welfare of Nepali children. In 1992, NYF’s first children’s home, J House for boys, was born out of a necessity of the heart – the desire to keep a group of homeless boys, supported in boarding school by NYF, living together in the ad-hoc family unit the boys had formed. The school had proved unsatisfactory for a number of reasons, but and NYF’s staff couldn’t find a good boarding school that would accept the entire motley group of boys. We didn’t want to separate them because they had grown so close to one another, with the older kids being so helpful to their younger “brothers.” So we rented a small two-bedroom house and hired a supervisor. The boys themselves named it “J House” after the house’s location in the Jawalakhel district of Patan, in the urban Kathmandu area. After two years, the first J House was full to overflowing, so we moved the kids to a larger and more comfortable home. By then we had taken in some girls, too, and J House became coed, with the top floor holding six girls. By 1994, even the larger house was bursting at the seams. It’s hard to turn these kids away! We rented another nearby house – and K House (for girls) was born. One would think that caring for over 40 rambunctious youngsters and supporting dozens more in school was already a handful. But in Kathmandu, everywhere you turn there’s more opportunity to help. Through local doctors, we learned of another pressing problem. Picture a sixteen-year-old rural mother carrying her sick, malnourished toddler on her back for days over rugged mountain trails to be treated for infection in a Kathmandu hospital. The child is cured of the infection but discharged while still severely emaciated – an all-too-common practice at the overloaded hospitals. 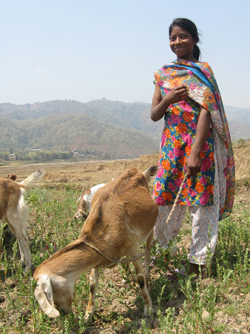 No one has taught that young mother how to prepare nutritious meals using the foods readily available in rural Nepal. With her child still malnourished, does she begin the long walk back to her village, where her child faces terrible potential for physical or mental disability due to lack of nourishment? Or does someone step in? In 1996, on a visit to Kanti Children’s Hospital in Kathmandu, Olga Murray discovered a five-year-old girl who was hospitalized with a severe lung infection caused by malnourishment. Her infection was cured, but she was discharged even though she had gained only 8 ounces of weight and could not stand or walk. The hospital needed the bed for acutely ill children. As we discovered, it wasn’t uncommon for children to be discharged as soon as their infections were under control, even though they were still pathetically undernourished. In 1998, we launched the first Nutritional Rehabilitation Home (NRH) with the recommendation and cooperation of a prominent pediatrician in the only general children’s hospital in the country. The NRH provides hands-on life-saving services that restore the child’s health and educates the mother in nutritious food preparation and child care. The NRH program is extraordinarily effective. It is located close to a major general hospital in the Kathmandu area. It has a big vegetable garden and plenty of space where mothers can learn about nutrition and newly-strong children can learn how to play at our playground. Not long after we first established the NRH, Som Paneru, NYF’s President, became aware of another desperate situation where we simply had to see if we could help. In the rural Western Nepal, young girls are sold into bonded servitude by their impoverished families. Typical of NYF, we were able to mobilize immediately. Led by a volunteer from the area, we made an exploratory visit. We worked closely with villagers to develop an innovative, effective means of preventing the practice of selling daughters. This Indentured Daughters Program was so successful that it quadrupled in size from the first year to the next, and since then we have saved more than 11,000 girls. Instead of being sold away, thousands girls now remain with their families, receive a piglet or goat, and are going to school. When NYF was profiled on “The Oprah Show” in May 2002, thousands of donors offered support for this project as well as NYF’s other lifesaving programs. That support enabled us to take on more girls. But many more need our help. We are working with these girls and their communities for the long haul. NYF is close to our goal of ending the tradition of bonding girls in Nepal. In the decades we have been working with children in Nepal, NYF has expanded not only in the number of children supported (from five to thousands), but also in the ways in which we help them. What has not changed is the intense sense of satisfaction and joy we get from our relationship with these lively and loving kids, and the admiration we feel at their courage and joy in overcoming the dreadful experiences of their early lives. With your help, we can continue to transform the lives of some of the most destitute children on Earth.